It began with a stolen cactus and ended in a deadly trek across a desert. In between Chet the Dog and his human PI partner, Bernie Little, help solve a fifteen-year-old crime. Returning home from a case, Chet no sooner trots through the door than he immediately senses something wrong in the Little domicile. He lets Bernie know . . .
“With a bark . . . not my loudest but sharp and quickly cut off, sending a message—Bernie, we’ve got a problem! Gun in hand, Bernie checked the safe . . . Taking down the painting, he spun the dial, and . . .
A quick inventory of people owning keys to the house turns up the fact that ex-wife Leda no longer has hers, having left it with Bernie’s next door neighbor. Skirting an immense potted saguaro cactus in the Parsons’ driveway, Bernie discovers the key mysteriously disappeared around the time Mr. Parsons’ son, Billy—just released from serving a term for kidnapping—came to visit. Before Bernie can comment on that, kindly old Mr. Parsons is arrested by an agent from the Department of Agriculture for receiving stolen merchandise, namely, one saguaro, a gift from Billy. Agent Newburg immediately raises hackles, both Chet’s and Bernie’s. “Can we ramp down the attitude?” Bernie said. Her eyebrows kind of went together in the middle and her mouth opened in that lippy way humans have when something sharp is coming . . . Special Investigator Newberg gave Bernie a hard look. Agent Newburg is also the owner of Shooter, a puppy who may or may not be related to Chet. Juggling custody of Mr. Parson’s dog, Iggy, girlfriend problems, and trying to find Billy, Chet and partner discover more missing cacti, and a series of holes in the desert, with a very unpleasant sight in one of them. Also missing is Shooter, but why would the killer take the puppy? Researching Billy Parsons’ background, Bernie discovers discrepancies in the case in which Billy and an associate kidnapped a local businessman’s daughter. The deeper he digs, the shadier the characters become. That includes the victim herself, Summer Ronich, now the wife of a prominent rancher, as well as tattooed, gun-toting twins, Billy’s partner in crime, killed the day he’s to leave prison, a Valley record promoter, and Valley Police Detective Brick Mickles, who hates Bernie as much as Bernie hates him. Bernie came oh so close to throwing his jab. All the suspects have one thing in common. They all knew Billy Parsons when he kidnapped Summer Ronich and all are aware the ransom money was never recovered. How does this tie in with the stolen saguaro Billy gave his father? If Bernie ever finds Billy, he intends to ask, but he may never get a chance. Abruptly Chet and his pal are separated. Bernie is wounded. Chet is chained and muzzled, aided in escaping by perhaps-son Shooter. “We walked down the hill. The chain clunked behind me, sometimes catching on a bush or a stone, forcing me to tug on it when I didn’t have many tugs left in me. With puppy in tow, and a long desert trek facing them, it’s up to a wounded and dehydrated Chet to find the villains and solve the crime. 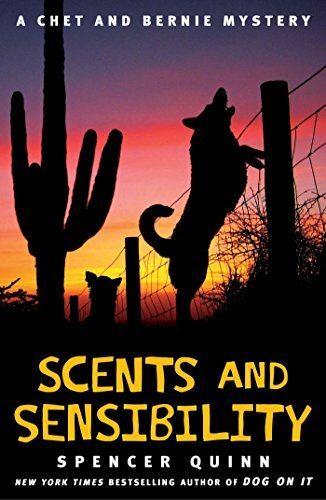 If you like dogs and also whodunits, you’ll enjoy Scents and Sensibility, a mystery starting out small and building to a large and fiery climax at a music festival in the desert. Action-packed with a touch of the hard-boiled detective at its core plus witty canine dialogue, its narration is both creative and whimsical in a way only a true dog-lover and talented writer such as Spencer Quinn could achieve.